Another reference to a temple, this time, in or near the old town, is contained in Al-Mas-udi's work as related by Guy LeStrange. By its height it sounds like the Temple of Jupiter Capitolinus that was on the Acropolis. "At Antakiyyah, on a hill within the city walls, is an ancient temple of the Greeks. At this place the Muslims have constructed a watch-tower from whence guards, continually posted here, can spy out any who come by sea or by land from the Greek country. This temple of old the Greeks held in great veneration, and made their sacrifices therein. 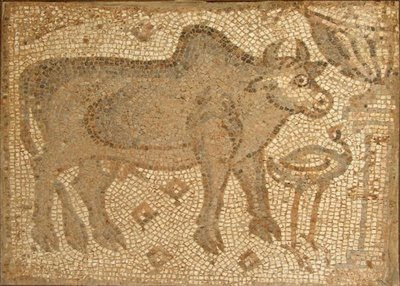 It was ruined by Constantine the Great, the son of Helena, who propagated the Christian religion. The place was at that time filled with idols and statues of gold and jewels of all kinds. Others affirm that the temple in question stood in the city of Antakiyyah to the right of the present Jami' Mosque. This was a great temple also, and the Sabaeans report it to have been built by Saklabiyus. At the present day, in the year 332 A.H., there is at this place the Suk (or market) of the armourers and lance-makers. Thabit ibn Kurrah ibn Karani, the Sabaean of Harran, who went to (the Khalif) Al Mu'tadhid in the year 289 (902), visited this temple and showed great veneration for the same, and what we have said above comes from him. " (Mas., iv. 55.)" This, like the Zoroastrian shrine, has an interesting set of identifiers by being placed in such close proximity to the Jami' Mosque. However, Jami just means mosque! So which one? Again we have the vague reference to the "right" side of the mosque. By Saklabiyus do the relaters mean Seleucus in some garbled repetition of the tale? "L'un était à Antioche, en Syrie, sur une montagne comprise dans l'enceinte de la ville et entourée d'un rempart. Les Musulmans ont construit sur le même emplacement un poste d'observation, d'où les vigies surveillent les mouvements des Byzantins sur terre et au large. Ce temple était en grande vénération , et l'on y célébrait des sacrifices; il fut détruit lors de l'apparition de l'Islam. D'autres prétendent qu'il fut démoli par Constantin le Grand, fils d'Hélène, cette reine qui propagea le christianisme. Il était rempli de statues et d'images en or, en argent et en pierres précieuses. D'autres soutiennent que c'était un vaste édifice qui s'étendait à gauche de la grande mosquée d'Antioche. 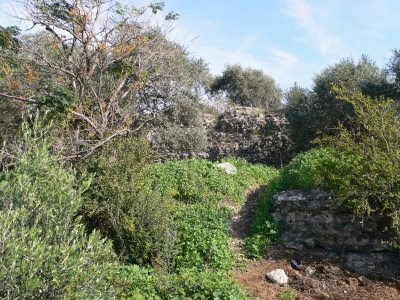 Les Sabéens en attribuent la fondation à Saklabious, En la présente année 332 de l'hégire, cet emplacement est connu sous le nom de « bazar des marchands de lances et de cottes de mailles. » Tabit, fils de Korrah, fils de Kerana le Sabéen, originaire de Harrân , s'étant rendu auprès de Môtaded-billah, l'an 289 (de J. C. 863), pour réclamer l'ennuque Waçif, vint visiter ce temple avec la plus grande vénération, et donna les détails qu'on vient de lire." Here the temple is to the left of the mosque, not the right as LeStrange has it, and the mosque is specified here as being the Grand Mosque. However the Grand Mosque is down by the river. The temple in the French version was also surrounded by a rampart, a feature not mentioned in the English version, which might also suggest the Acropolis. We note (from Weulersse) that there was a quarter (Sakkakin) of the knife makers (couteliers) which was separate from the souq of the same trade. The latter was down by the riverside with the other souqs. "There is at Antakiyyah a building called Ad Dimas (the Crypt). It stands on the right-hand side of the Great Mosque, and is built of huge blocks of stone, as though of 'Adite (Cyclopeian) days, and it is wonderful to see. On certain of the nights of summer, the moon's (beams) as she rises each night, shine in through a different window. It is said that this Ad Dimas is a Persian building of the time when the Persians (under Sapor, in A.D. 260) held Antakiyyah. and that it was built to be their Fire Temple." (Mas., iv. 91.) "
"Il y a dans la ville d'Antioche , à droite de la mosquée cathédrale, un édifice qu'on nomme dimas (crypte, catacombe); il est bâti en pierres adites, c'est-à-dire en blocs massifs. Tous les ans, dans certaines nuits d'été, la lune, en se levant, entre par une des portes situées au faîte. On prétend que le monument nommé dimas était primitivement un temple du feu bâti par les Perses, quand ils possédaient Antioche." This text is noticeably different to LeStrange's embellished version. This building referred to may be to a temple of Mithras (a cult to which Julian has sometime been linked) or may indeed be some Zorostrian shrine. It is very interesting because it also gives us a relatively definite location as the Grand Mosque is still extant, down near the River Gate. What the author means by the "right-hand side" is not clear but it seems to indicate that this structure was hard-by the Mosque. If the blocks were so large it may have just ended up getting buried as the city "rose" over time rather than be dismantled for reuse. At least it is a target that archaeological efforts could be exerted upon. Maybe using the word "university" to describe the educational institutions of the ancient world is too ambitious a usage of the word for a function that only came into existence very much later. We can say that ancient cities had schools of thought or institutions where important scientific ideas and inventions were created but they were not officially sanctioned universities as we know them today or even as they were known in 1300 AD. Maybe the discriminating fact is that the ancient schools were not "universal" in their subject matter. Different places were known for different things. Antioch renown was almost exclusively for its sophistry, of which Libanius was its most renowned exemplar. Alexandria on the other hand was famous for its sciences (amongst other things) and left a plethora of inventions which Antioch did not. Athens withered in importance during the Roman period and yet retained a reputation for philosophical discourse. Indeed, one of the great Epicurean texts was recorded by Diogenes at Oinoanda, an obscure hilltop city in Cilicia. Genius was not restricted in to the metropolii. We are prompted to write this chapter as we have recently come across a volume from 1910 entitled "The Universities of Ancient Greece" by John William Henry Walden which can be found here. Walden posits his thesis on the educational institutions of the Greek period (and Roman Empire) being universities somewhat akin to those that we know now. He devotes several chapters to Antioch and Libanius. It is well known that Libanius often discoursed on his pedagogical activities and many of his letters were on the trials and tribulations of his career as a teacher. Walden immediately threw me on my guard when he referred, in a footnote, to the Bouleterion as a "temple" despite describing it as a "city hall" in the main text. The Bouleterion was a very common urban structure in Greek cities and was well known to be the City Council meeting house and never can be mistaken for a "temple". That throws everything else under a shadow. However, Walden is correct in not drawing too many inferences of the institutions in Antioch constituting a university and admits the lack of information on anything besides Libanius' own doing and work environment. To start with Libanius' "class" at any one time may have numbered as few as 15 students. Universities should be made of sterner stuff. Walden also mentions the existence of the Museion in Antioch and can make no link between Libanius and this structure/institution. Was the Museion a school/university or merely a Temples of the Muses? In Alexandria we know the Museion morphed into a school but "museion" is not synonymous with "university" it was just a structure that served a useful purpose as a teaching hall, just as the Serapeum in Alexandria did. It doesn't mean that every Temple of Serapis in the Empire must be a school by inference. As Walden points out the Athenaeum in Rome functioned as a sort of "university" while in Athens the Agrippaeum played a similar role. Name of a building clearly means nothing or little in indicating that it might possess some educational function. Libanius, during the most of the time he was at Antioch, held his school in the city hall — the Bouleterion. When he settled at Antioch, he was in great distress because his students were so few. "I had, meeting at my house," he says, "a class of fifteen, the most of whom I had brought with me from Constantinople, but I did not yet hold a public appointment. My friends were discouraged, and I was thoroughly disheartened. Oppressed, like Peleus's son, by inactivity, I called myself 'a weight upon the earth,' and even had recourse to drugs to save my mind. I had found things at Antioch not what I had expected, and to Constantinople I could not return without encountering ridicule. At this time there came to me an old man, who told me that it was no wonder that I did not succeed when I lay at my ease in my in my own house, for, of course, those who sat in public had the advantage, 'If you wish,' he said, 'to see how many there are who thirst for knowledge, go to some temple.' This advice of the old man I did not precisely follow, but, inducing a shopkeeper down town to move, I installed myself in his quarters, and thus set up my chair close to the market-place. The situation did something, for the number of my students — fifteen, as I have just said — was increased more than threefold. The Museum, however, which was a great help to those that held it, was in the hands of my rivals." Of the school system of no ancient Greek city of this period have we so much information as of that of Antioch. And yet the details even of this system are often hard to make out: Libanius, our principal informant, leaves us all too often to conjecture and inference. The matter is most important, however, for, aside from its intrinsic interest, its determination may cast light on the school systems of other Greek cities of the second, third, and fourth centuries A.D. In the speech which Libanius addressed to the municipal council of Antioch when, some time between 355 and 361, he came before that body to plead for a special dispensation in favor of the four rhetors to whom had been assigned the single salary of the sophist Zenobius, he tells the relation in which he stood to these four rhetors. They were, he says, his associates and his fellow-workers in the same ranks, they 'sang' (i.e., taught and declaimed) in company with him and were members of the same 'chorus' , or circle; they lived with him; they were under his direction;' he was thoroughly acquainted with their condition; he was the 'coryphaeus,' or leader, of the 'chorus'; for all these reasons he appeared as their spokesman. These expressions seem sufficiently clear, and yet we are immediately confronted by several questions. The first question relates to the constitution of the school itself, if school we may call it. Were these five — the four ' rhetors ' and Libanius — the sole members of the school or were there others? No mention of others is made in this speech, but it is not improbable that the school, if not at this time, at least later, had in its corps of teachers one or more “grammarians” as well as a teacher of Latin eloquence. One 'grammarian' Libanius certainly had assisting him in the year 361 and in several letters of the years 356 and 357 Libanius urges a certain Olympius to return from Rome and take charge of the Latin department of his school, under appointment from the city. Frequent reference is also made to under-teachers who were assisting Libanius in his work, but whether these teachers were all rhetors or not is uncertain. The assistants in Libanius's school were in receipt of an official salary, and it was their duty to conduct such lessons as the sophist imposed upon them. In case the sophist was sick or for any other reason was unable to meet his classes, one of the assistants took his place. The sophist seems to have had a certain amount of authority over the assistants even in matters not connected with the class-room. Whether Libanius was the Head of the school simply by virtue of his distinction as a teacher and orator, or by special appointment, either from the council or the emperor, is not perfectly clear, but apparently his position was official and carried with it an official salary. Other questions which arise are: Did these five sophists constitute the entire sophistical outfit of the city at this time, or were there other teachers of eloquence at Antioch, either teaching individually or forming a school or schools similar to this school, and, if there were other schools, did the members of these also, as did the members of Libanius's school, have official appointment and salary? Notwithstanding that from one passage in this speech we should be inclined to infer that these were the only sophists teaching at Antioch at this time we can hardly believe that such was the case. The city was a famous seat of sophistry, and the mention of other teachers of the subject working there at various times is not infrequent. It is even probable that in some cases these were members of schools. Thus, Eudsemon, a 'grammarian’ and Harpocration, a sophist, were working together in some sort of educational partnership at Antioch in the year 358. Further, the mention in the passage above referred to and elsewhere of a 'chorus of sophists' seems to impart to the term a certain definiteness as a unit that suggests the possible presence in a city of as many as two or three schools at once. Such schools, if schools there were, may have been private schools, in the sense that the members had no official appointment and salary, though that the members had no official appointment and salary, though doubtless subject to official supervision and direction. Sophists and rhetors, however, were not the only teachers who were established at Antioch: there were also philosophers, 'grammarians,' lawyers, and various others of lower grade. All these, together with the sophists and rhetors, constituted the School of Antioch, and of this School — not simply of his owncorps of rhetors — Libanius was Head. He had general oversight and supervision of matters pertaining to the teachers and schools of the city, subject, of course, to the implied direction of the municipal council and the emperor, and he acted as the mouthpiece of council and teachers in their dealings with each other. It even seems to have lain within his prerogative to make the selection of a new teacher, and his power was great enough to compel at times a teacher's acceptance of a call or to increase a teacher's salary. 'When it was determined to establish a chair of law at Antioch, and the council had passed an order putting the determination into effect, Libanius set about to secure a man to f ll the place. He fixed upon Domnio, or Domninus, who was then teaching at Berytus. In the letter which Libanius wrote to Domnio offering him the chair and urging him to come to Antioch, he spoke as one who was in charge of affairs and whose privilege it was to select the teachers and, if he so desired, to compel their attendance. On another occasion Libanius was instrumental in increasing a sophist's salary. Sometimes parents brought their boys to Libanius for guidance and advice in the matter of studies, and Libanius placed the boys among the different sophists. Again, the sophists themselves would come to Libanius after school hours and make such complaints with regard to their condition as occurred to them. By no means were the different sophists of the town always harmonious, however; we see them receiving one another's renegade students and vilifying one another's good name, and Libanius found it necessary once, in the general interest of all, to recommend common action putting an end to this state of affairs. The importance of the position, which Libanius held as, Head of the School of Antioch is shown by the fact that, as he says of himself when at the height of his career, he had no rival. The under-sophists, being none of them superior to another, were obliged to compete for the favor of the students, but not so he, who was overseer of them all. It was in virtue of this position as Head of the School that he was called by John Chrysostom " the Sophist of Antioch." In a passage in one of his orations Libanius takes occasion to describe the etiquette that was observed in the conduct of the members of the School toward their Head. There had been two Heads preceding himself. The first of these had been a native of Ascalon, in Palestine — a man tyrannical in temper and strict in his requirement of the observance of form. Whenever he appeared in the school-room, all the teachers had been expected to rise and attend him as long as he remained or until he gave them permission to sit. No one was to raise his eyes or look his master in the face, but all were to acknowledge his supremacy. He had even been known to threaten or to strike a teacher on occasion. Imposing a certain tax (the nature of which is unknown) 'on the students, he had made the teachers responsible for the payment of this. The second Head, also a native of Palestine, had been of an entirely different disposition from the first. He had not aimed at the same personal ascendancy, nor had he even been acquainted with all the teachers by name. Libanius, as he himself affirms, was different from either. Affable and genial, he mingled freely and on equal terms with the teachers, allowing them to jest in his presence and oftentimes himself taking part in the sport. It is probable that the school system of Antioch found its counterpart, though generally on a smaller scale, in most cities of the Greek world at this time. There was apparently a school at Gaza similar to that of Harpocration and Eudsemon mentioned above, and another at Apamea resembling Libanius's, while Themistius, doubtless, held much the same position in the School of Constantinople that Libanius held in that of Antioch. Those who filled the chair of sophistry at Athens in the second and third centuries seem to have been at the same time Heads of the School of Athens, and the position for which there was such competition after the death of the sophist Julian in the fourth century was doubtless the same as that held by these men in the preceding centuries. 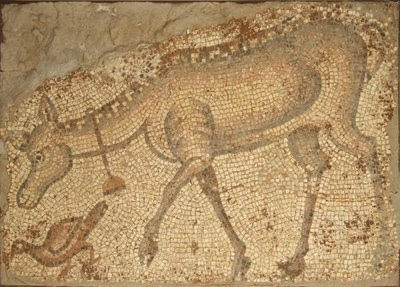 At Antioch teaching was usually confined to the forenoon, the hours after the mid-day meal being left free of lessons, but this rule was probably often broken; Libanius at one time had so many students that he could not get to the end of them till evening, while Acacius sometimes taught till night. At other places the custom in this regard may have been different. Philostratus says that the most of the sophist's day was devoted to teaching. Lucian intimates that children went to school both in the morning and in the afternoon. Probably a difference was made between the elementary and secondary schools and the university. Sometimes a man taught rhetoric in the forenoon and 'grammar' in the afternoon, and Eunapius, while engaged in teaching rhetoric in the morning, himself took lessons in philosophy under Chrysanthius in the afternoon.' The long vacation extended from the early part of the summer until well into the autumn. Often, however, sophists gave displays during the summer months, and these were sometimes attended by the students who were in town. Occasionally a sophist broke through the custom here referred to, and, as a mark of special consideration, took a student even in the summer. Holidays regularly occurred on the days of the pagan festivals. Custom, however, prescribed that on certain other occasions as well the regular exercises of the day should be omitted. Thus, at Antioch, it was usual, when some distinguished man or the relative or friend either of the teacher or of one of the students died, for the teacher, perhaps accompanied by his class in a body, to honor the funeral with his presence. If this was not done, he spent the day in eulogizing with his students the dead man's virtues. Again, when any one of the sophists held a public display, it was customary for all the students of all the sophists in the city to be released from further work on that day, and, in Libanius's school at least, the display of one of the students was the occasion for a similar holiday. Irregular 'cuts,' due to unforeseen circumstances, doubtless often occurred. Libanius lost every year a number of days by reason of his health, and at the time of the great riot at Antioch the schools were closed for thirty-four days. Otherwise the occasions when students who lived out of four days. Otherwise the occasions when students who lived out of the city interrupted their studies to go home seem to have been few; the death or urgent need of some member of the family was generally required." This work needs to be read in conjunction with the footnotes. What to make of it? We suspect that this was not a university per se but a school for sophists, an Antiochene specialty. These were not mere dwellers in ivory towers but constituted a good proportion of the legal profession where performance skills, somewhat like today, can be as useful as knowledge of the law and precedent itself. Libanius and his School does not sound like a law faculty of a greater university but rather a municipally-funded law school and nothing more than that. All well and good. The ancient world did not suffer from its lack of universities. Great minds will ever "do their thing" whether it is wandering in a stoa in Athens or discoursing in the backroom of the Bouleterion in Antioch. A very interesting source for the issue of the street layout is Antioche - Essai de Geographie Urbaine by the noted French geogrpaher Jacques Weulersse. This was written in 1934. While it might seem a quaint snapshot of the city at this point in history (the population was only 30,000 at the time), in fact, it contains a wealth of hints and data that cannot be found elsewhere (even in the works of the Committee for the Excavation who were prowling the locale at the same time). It almost seems that they didn't meet for some of Weulersse's observations would have sent me scurrying in a different direction than that of the Princeton crew. 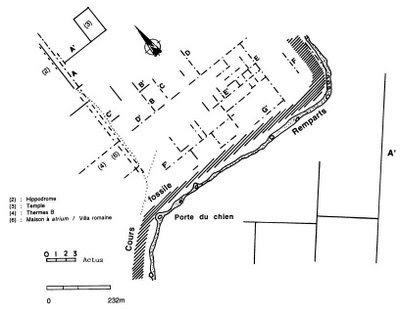 Later sources chiefly refer back to Weulersse in reference to his observations on the layout of the blocks of the modern city that coincided with those of the ancient Hippodamian plan. 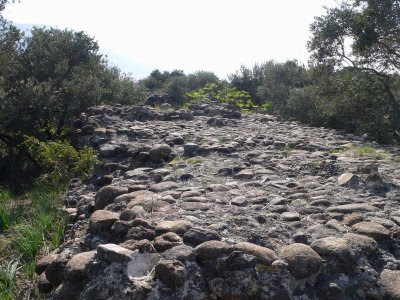 However, we also note the interesting fact that the Dort Ayak district of the town is Turkish for "tetrapylon" and moreover there were ruins of this structure visible at the junction of the main road (overlaying the colonnaded street) and two of the side streets (the modern Dogu Souk and Kubilay Souk). No-one in the expedition mentions this fact. Then we wonder if these ruins were apparent to Weulersse, how was this possible if the original street level was supposedly so far underground? In Weulersse there are a wealth of maps of the city in the 1930s. We reproduce below one that shows the "old" city from the bridge to the edge of the town sprawl on the northern (really north-eastern) side of the city. He clearly shows the continuance of the ancient street pattern in the top left corner of the map (click to enlarge). 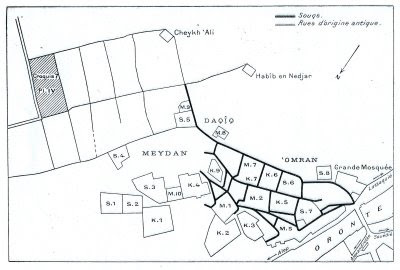 The "extra-large" block that breaks the uniform pattern of the blocks is shown where the Cheykh Ali Mosque is sited. At the bottom the darkly outlined areas are the khans and souks of the commercial district. As we have noted elsewhere the block sizes between the Island and the "mainland" part of the city vary. However, we note here that the block lengths differ by which side of the colonnaded street they are on. The blocks on the river side are shorter than those on the mountain side of the main street. Taking the width of the most "original" block (that marked "Croquis 7") we can then project the blocks to the south (i.e. the right) of the oversized block. If we do this we find that one of the streets produced runs down in exact line with the old Roman bridge. Then taking the length of the "shorter" blocks to the west of the colonnaded street (i.e. towards the bottom of the map) and adding another two blocks of exactly the same length we find that one of the north-south streets produced meets the street mentioned in the previous paragraph exactly at the bridge. 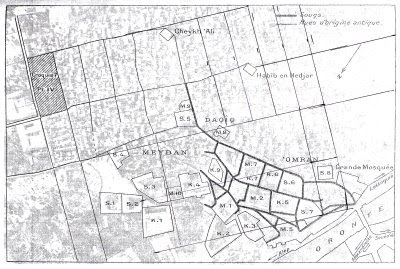 Thus the reconstruction of the streets in the "old" city might look as shown in the plan below (click to enlarge). One feature of the Island that the Princeton Expedition of the 1930s scarcely looked at, nor mentioned, was the "temple" site. This stood two blocks east of the hippodrome, so was very close to where they were operating. This is visible in aerial photographs from the 1920s and is shown best in the Poccardi article. Below is the map from the Poccardi work showing the temple (at letter 3). This was a fairly massive temple with a podium measuring 107m by 71m covering two city blocks. It has recently been the subject of testing by the only group that is currently working in the Antioch site. It consists these days of the rubble core of the structure. We have seen no speculation on which god the temple may have been dedicated to. A collaborator,JØRGEN CHRISTENSEN-ERNST, visited the site this week and took the following photographs. This last image shows the top of the podium. In 2004, a team of archaeologists (Hatice Pamir et al.) with a geomagnetic approach visited the site. There report was as follows: "The so-called temple, the rubble core podium of which still stands at a height of 5 m, underwent a preliminary documentation. 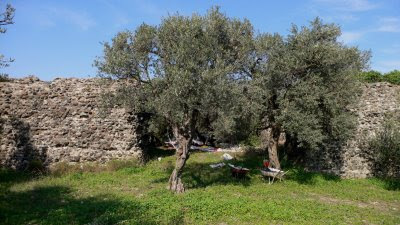 A geomagnetic survey was conducted west of the temple, on the periphery of the adjacent hippodrome, which became part of the tetrarchic palace at Antioch in the late 3rd century. 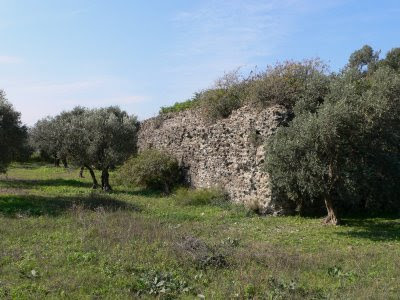 The remains of an opus caementicium wall, which once separated the Basileia from the rest of the city, was provisionally documented and so were most of the monuments registered by the American excavators". This is a different post to the usual. We try to be timeless (he says modestly) but this merits a mention and recording. 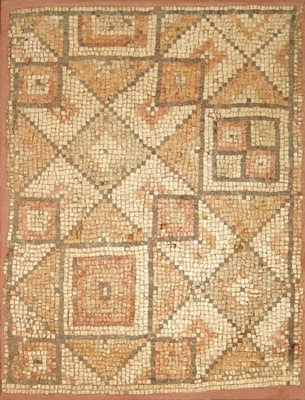 Geometric floor pattern fragment, shades of brown. Set in cement with metal framework. No mark. Size: 45 1/4'' x 35''. Depicts donkey with bell and duck, set in cement with metal framework. No mark. Size: 38 1/4'' x 54 1/4''. 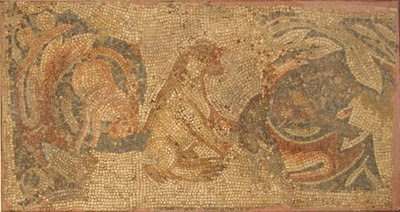 Fragment depicting several animals, set in cement with metal framework. No mark. Size: 30'' x 57''. Condition: age appropriate wear, minor losses to edges. Scene of two palm -like branches and smaller scattered flowers. 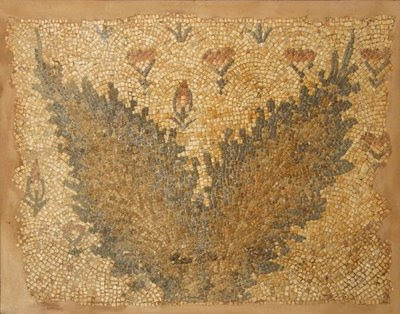 Mosaic set in cement with metal framework. Size: 33 3/4''H, 43''L. Geometric floor panel with six octagonal sections with stylized floral centers, set in cement with metal framework. No mark. Size: 36'' x 48 3/4''. Condition: age appropriate wear. 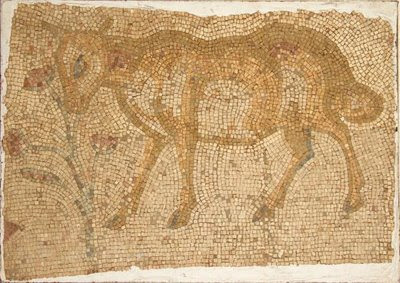 Mosaic of animal, possibly a deer. 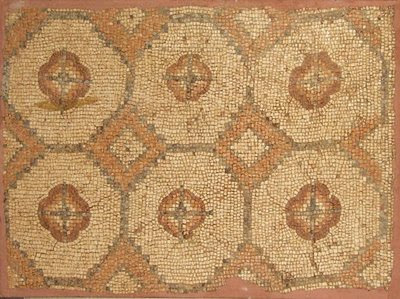 Mosaic set in cement and metal framework. Size: 31 3/4''W. 46''L. Depicts bull and egret with urn on column, set in cement with metal framework.. No mark. Size: 38'' x 43 3/4''. Frankly we were rather stunned but we shall refrain from passing judgement on these items and their provenance. We welcome comments. If they are the real deal, then they look museum quality and leave us wondering where they came from and why they aren't in a museum!! They certainly have similiarities to the themes that we have seen in Antiochene mosiacs.